The man was found unresponsive near to Dublin’s Four Courts on Monday evening. 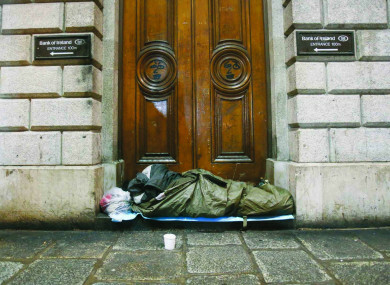 A MAN WHO had been known to homeless services in Dublin city centre has died. The man – who was originally from Lithuania – was discovered unresponsive in the area around the Four Courts in Dublin on Monday. He was rushed to a nearby hospital where he was pronounced dead. The man had been known by outreach teams and is believed to have been engaging with homelessness services since 2013. It is the second death this week of people who had been known to homelessness services. Yesterday, a homeless man who had been staying in a tent near the grounds of Gonzaga secondary school in Ranelagh also died. He had been known to homelessness services since 2010. The deaths bring to seven the number of people sleeping rough who have died in the past 12 weeks. In a statement, a spokesperson for the Dublin Regional Homeless Executive – which manages homeless services across the four Dublin local authorities expressed their condolences with the families of both men. In relation to the man who died in Ranelagh, the DRHE said he had been accessing homeless services since 2010 and was placed in emergency accommodation – including temporary supported accommodation – on a number of occasions. “Outreach teams had engaged with him on many occasions to access accommodation and relevant supports,” the spokesperson said. Unfortunately support services were unable to progress this man to a more permanent housing solution after he left his last placement. The last known contact with homeless services seeking emergency accommodation occurred on 21 st November when he was provided with emergency accommodation. In relation to the Lithuanian man who died, the DRHE said that he was accessing homeless services since 2013 and was placed in emergency accommodation including temporary supported accommodation on a number of occasions. “Outreach teams had engaged with him to access accommodation and relevant supports,” the spokesperson said. Around the time of his passing this man was in supported emergency accommodation where the Harm Reduction Team was actively engaging with him. Pat Doyle – CEO of the Peter McVerry Trust – earlier expressed condolences with the families of both men. “Our heart goes out to them. It’s freezing out there, it’s not safe to be a rough sleeper,” he said on RTÉ’s Morning Ireland. Anthony Flynn – CEO of Inner City Helping Homeless – said that extra cold weather emergency beds – promised for later in December – needed to be delivered as a matter of urgency. “The 2 men that died were human beings with their own name, story and families and to die outdoors in sub zero conditions is unacceptable,” he said. Irrespective of the exact cause of death we shouldn’t be in a position where people are dying alone on the streets of our country. In it statement, the DRHE said that it was “fully cognisant” of the potential impact of severe weather on people who are sleeping rough and that “every possible effort” was being made to ensure no one would have to sleep rough. The spokesperson pointed to the enhanced service provision, announced last week as part of the Cold Weather Strategy. The latest official rough sleeper count was carried out earlier this month, and found there were 184 people bedding down in streets, doorways and green areas. That figure represents the highest on record since the official count began in 2007. It is also double the figure seen during the winter of 2015. The Housing Department reiterated the DRHE statement and said that it was aware of the deaths and that a Garda investigation is underway in respect of both cases. Email “'Our hearts go out to the family and friends': Two homeless men have died in Dublin this week”. Feedback on “'Our hearts go out to the family and friends': Two homeless men have died in Dublin this week”.